This technique works particularly well with variegated yarns and the garter border makes it easier to pick up stitches on your heel flap. Row 1 (RS): sl1, k3(4), *k1, sl1. Rep from * until 4(5) sts rem. K to end of row. Row 2 (WS): sl1, k3(4), p until 4(5) sts rem. K to end of row. Row 3: sl1, k3(4), *sl1, k1. Rep from * until 4(5) sts rem. K to end of row. Row 4: sl1, k3(4). P until 4(5) sts rem. K to end of row. 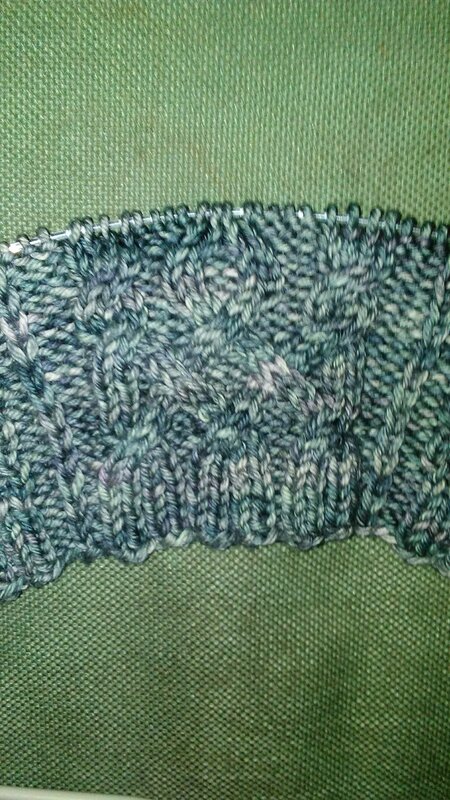 Repeat rows 1-4 until desired length, then work heel turn as written. One of the advantages of the garter border is that you can count garter ridges and have your heel flaps the same length. Once again, I’m dusting off the cobwebs and popping in for a quick “Hi!” with a little bus knitting. Big things are a coming. Winter has finally settled in and I’m scrambling to find and make hand knits for everyone. Thing 2’s sweater has been sleeveless for weeks so I’m trying to get them done today so I can wash it tomorrow so he can wear it to school on Wednesday. I’m also making him a replacement hat because that seems to have disappeared over the summer. The husband lost his neck warmer, so he needs a new one. I found a slouch hat I knit last year but it really is too big on me. I knit a new one in some bulky yarn from stash, even bought a fur pom pom for it, but after some aggressive blocking it still doesn’t fit properly. I have another skein in the same color so I’m going to knit myself a Barley from it so it’ll be super thick and warm. My nephew’s sweater didn’t get finished for Christmas so I need to work on that too. Once every one is suitably clad in hand knits, I can go back to selfish knitting. Today I’m knitting a Tin Can Knits Barley hat as a late Christmas present. I realized I wasn’t going to have enough yarn to finish it with the skein I was working from, so I went upstairs to find some more yarn. In the obvious place, I found a skein of Red Heart Super Saver and I have a small snob streak that wouldn’t let me make a gift from it. I decided to do some stash diving (literal diving because my stash is in bins all over the house) and I found this long, wide tube knit in stockinette. I have no memory of ever making it and I have no idea what it’s for. I’m pretty sure it’s Lamb’s Pride since it’s a single and I know I had some years ago in that color. It was more than enough to make a hat, so I fogged it and I’m almost at the spot where I stopped the first one. I really need to organize my stash. God only knows what other strange things are lurking about the house.